Oh do I have plans for these cute acorn jack-o-lanterns. What will start as a great Halloween craft for kids will end up filling one of my apothecary jars as a fun Halloween decoration. 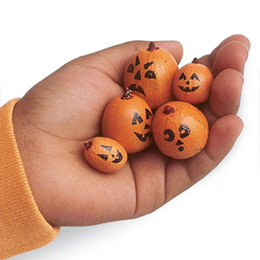 We already have the orange acrylic paint and the black permanent markers, now I just have to send the kids out to the front yard to collect acorns. Another activity to keep the kids busy! You can check out the tutorial for these acorn pumpkins over on Family Fun. And check out the other Halloween decorations and jack-o-lanterns that have been featured before.